After working on the copy edits with Copy Editor Jess (who genuinely made me grin with some margin comments like: peanutbutter and honey on toast, really? Actually that sounds nice, I’ll try it!) I sent the manuscript back for checking over. The copy edits were okay for most part, the toughest part was the ending where CEJ (Copy Editor Jess) really nailed me on descriptions and slowing the action down a bit for the reader to catch up. It was tough, that bit, but overall I really enjoyed the experience and had little enough to moan about. 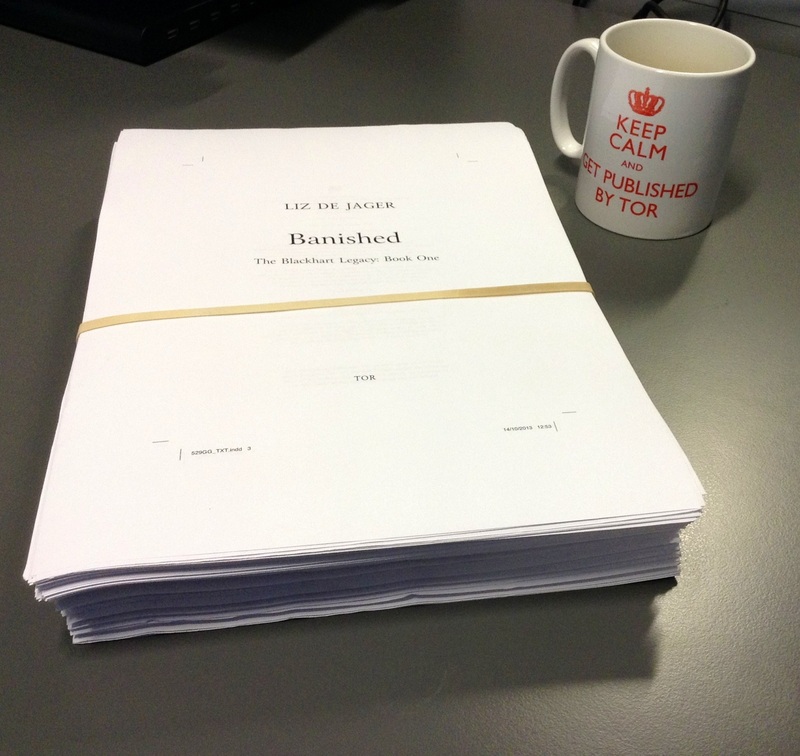 The next step in Liz Being Published is doing the Page Proofs on Banished. This is the manuscript in all its glory. Had to give my Tor mug some show, too! So daunting – 400 pages of words wot I wrote. But also exciting. Join us at @Bluewaterstones Oct 27th for a writers night with @LizUK and @ThatAndyBloke 6-8pm. 2. I’ll also be at World Fantasy Con in Brighton. I’ll be attending as a utter fan-girl and won’t have any panels to sit on, which means I get to rush around and fangirl at people like Holly Black, Sarah Rees Brennan, Ellen Kushner, ROBIN HOBB OMG!, James Lovegrove, Mike Carey, Mark Buckingham and Bill Willingham (they write FABLES!) and a lot of other people. A LOT OF OTHER PEOPLE. There will be lots of chat, lots of hanging out, corridor parties…and most importantly, staring at people’s chests going: who are you and how do I know your name again?? 3. Then on Monday night, there’s an event at Foyles with Holly Black and Sarah Rees Brennan which I’ll be going to. I love both these writers utterly and am currently reading Holly’s Coldest Girl in Coldtown and it is one of the darkest books I’ve ever read and I love it. Then, I’m in the process of writing a small short story for the blog. A group of us will be doing it, to celebrate WORDS and Halloween and all things dark and creepy. So that should go up the weekend of 26th October. I will also be on a fab blog talking a bit about Banished in November. The blogpost will be hosted by Sam, over at Realm of Fiction. November is UKYA month for the blogging and writing community. We want to talk about books written by UK writers for UK teens (and general younger readers and them older folk too) but in general, we just want to talk about UK writers and what it’s like being a writer, about books and reading and living on this tiny island and how it influences us, because really, it has to, right? This campaign is spearheaded by a dynamo called Lucy and this is the Project UKYA website. And of course, lastly, but by NO means the least, there’s our very own convention next year. Read all about it here. I am so excited. Even if I’m not attending as Liz the Writer, I will be there as Liz the Fangirl. Also, Malorie OMG Blackman is such a rockstar. I love her to bits. And I’m kinda swaggery that she lives in the same area I do. Oh yeah, power of words in the water! RIGHT? Seriously big names. Jamie, I’m alerting you now to the fact that World Con is taking place in the UK NEXT YEAR. Be aware of this and consider booking tickets. Woah, this all sounds like seriously exciting stuff. Did you sit and stroke your page proofs for a while? (I did when I got mine!) Can’t wait for the UK YA convention – I am definitely going!! – and isn’t Lucy amazing? We need more people like her! @Emma – right? I’ve not had a chance to stroke my pages. I’ll do it tonight when I get home. 😀 I have several red pens too. Just in case. Lucy is very cool – there’s so much love from the bloggers and it means a lot.